New Arista Nashville artist Adam Brand was in Alabama recently as part of his first radio tour in the U.S. after making a name for himself as a recording artist in Australia. Brand played his upcoming single, “Ready For Love,” for The Big 95/WHMA Anniston’s Stuff a Bus Fundraiser. 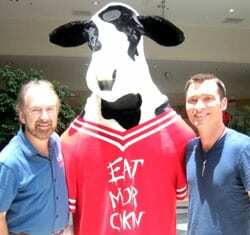 (L-R): WHMA OM Tex Carter, a Chick-fil-A cow and Brand. It’s a tennis match at the top of the CountryBreakout Chart and the latest volley comes from Keith Urban, whose “I’m In” recovers its No. 1 positioning after being displaced last week. Blake Shelton’s “All About It” slips back to No. 2, only nine spins behind Urban. Both records are young, and anything could happen at this point. Strong records from Zac Brown Band (“Free”) and Lady Antebellum (“Our Kind Of Love”) are a few steps back at No. 5 and 7, respectively, but it shouldn’t be too long before they’re vying for the top spot. Don’t count out a run at the top by Kenny Chesney in the near future, either. His latest, “The Boys of Fall” is white hot. After nailing the biggest debut at No. 49 last week with no prior reports, the song received an additional 812 spins in this chart cycle to move on to No. 26. Reba’s “Turn On The Radio” has accomplished a similar feat—it debuted at No. 50 in the previous chart, and has now rocketed up to No. 35. Brightwell’s first day on the job is Thursday, July 29. Starting Monday, July 26, the WTRS morning show will be known as the Dave & Bo Show. 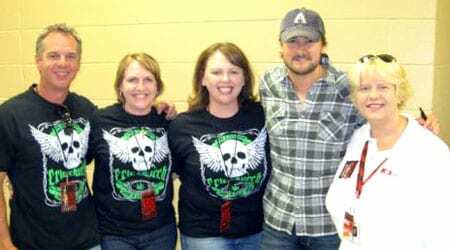 EMI Records Nashville’s Eric Church recently made a tour stop in Memphis, TN. His current single “Smoke A Little Smoke” is currently climbing the charts and he will join Miranda Lambert for CMT’s On Tour this fall. (L-R): Steve Hodges, Sr. VP Promotion Capitol/EMI; Angela Lange, VP Promotion EMI; Trudie Daniell, Regional Dir. Promotion EMI; Church; and WGKX/Memphis APD/MD Kay Manley. The JaneDear girls recently gave a concert for WUBL/Atlanta staff. 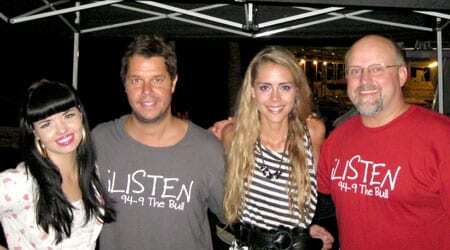 (L-R) Susan Brown, WUBL morning personality Jason Pullman, Danelle Leverett, and WUBL PD Scott Lindy.